If you were in Bath this summer, you could have checked out the Falun Gong art show at the Octagon on Milsom St (where the RPS used to be). This was one of the weirdest things I have ever seen; a mix of religious imagery and torture paintings, mostly made using a range of Communist, Buddhist and Christian iconography - but entirely believable for all that. It was interesting to see the number of people dressed like Chinese Jehovah's Witnesses wandering about - they made me wonder who they were. Also interesting were the number of Chinese tourists wandering in and taking a look at something they won't see in their homeland. They seemed to particularly enjoy the picture of a Jiang Zemin lookalike being tortured in the pits of hell. You can see more of the show work here. Here are a couple of pictures with notes from the website. 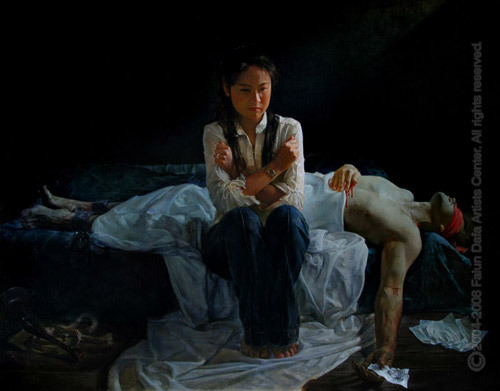 "A young woman is stricken with grief as her husband lies dead by her side, broken by torture in a brainwashing center. In his hands are documents authorities demanded he sign, disavowing Falun Dafa; they are torn in half. For many, refusal leads to torture and even death. Human rights groups have documented the deaths of over 3,000 Falun Dafa prisoners of conscience in China." 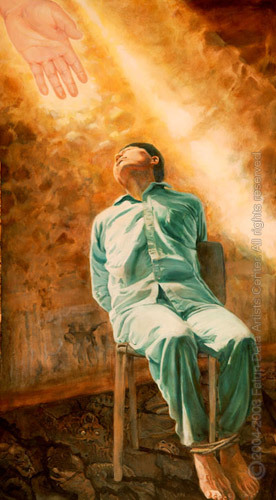 "Bathed in a warm, golden light that represents resilient faith is Chengjun Liu, shortly before his death by torture in a Chinese prison. Ghastly images animate the floor, suggesting the horrors he endured in captivity as a prisoner of conscience. Liu was arrested in March of 2002 for his part in a defiant television broadcast that exposed human rights violations against Falun Dafa and the culpability of government officials." 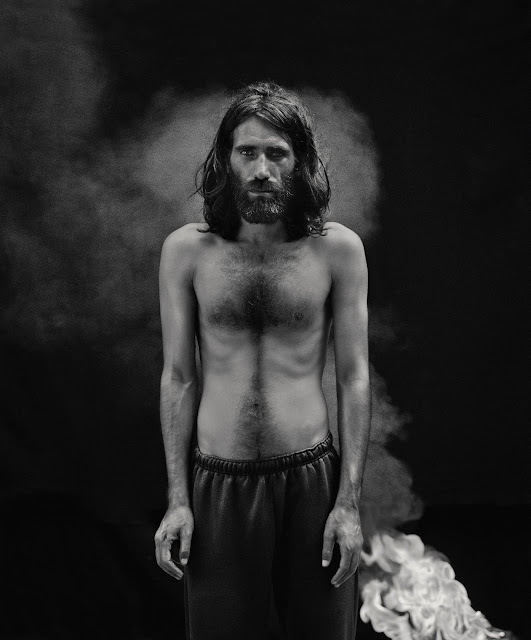 It travels around - it's a strange, strange exhibition but the persecution is all too real. Look forward to hearing about your culty experiences, Deborahk!